He was referring to the 2 yard touchdown run that put the Tigers up 22-21 with 20 seconds left in the game this past Saturday at Jack Trice Stadium. 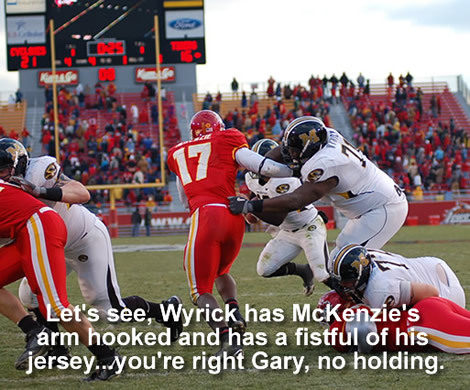 Pinkel was visibly upset after offensive lineman Myron Wyrick was called for a holding penalty which nullified the TD. “I’ve been coaching 30 years, and I’ve never seen an offensive holding call inside the 2-yard line on a run play,” Pinkel said after the game. Well, I took the picture and I saw a hold too Mac. I’m not sure why the Big 12 office feels they need to apologize for apparently ‘blowing it’, when they didn’t. Maybe it saves them time if they just apologize for the calls they get right. This entry was posted on November 22, 2006 at 5:55 pm	and is filed under Brad's Blog. You can follow any responses to this entry through the RSS 2.0 feed. You can skip to the end and leave a response. Pinging is currently not allowed. send your picture to the big 12 office please. Is there anyway that Cyclone fans can buy a picture of this and send it to the big 12 office and get an explanation for why this isn’t holding.